When it comes to buying a new tumble dryer there are many things to consider. From price, energy efficiency and functionality through to load capacity, colour and size; there are a wide range of factors to consider when deciding which one to buy. A common concern is whether to buy a condenser tumble dryer or a vented tumble dryer. These are words that you’ll often come across when looking at tumble dryers, but what actually is the difference between the two, and are these differences any reason to buy one over the other? Here we’ll look to answer the question “what’s the difference between condenser and vented tumble dryers?”, so when you go to buy your new tumble dryer you’ll know how they differ and which one will be best for you. The main difference between a vented dryer and a condenser dryer is how they remove water from the machine. Vented tumble dryers are more common. They feature a long, flexible hose that connects to the tumble dryer and vents the water to the outside of your home. Since a vented tumble dryer removes water and moisture via a hose, it will need to be installed close enough to an external wall or window for the hose to reach outside. So what does having a ‘condenser dryer’ mean? A condenser tumble dryer collects moisture from your wet clothes in a container, sometimes referred to as a reservoir, which is located within the dryer itself. This tank collects the water and when it’s full you simply have to empty it. Most modern models tell you when the tank is full. This is beneficial for many people as it means you can place the unit pretty much wherever you like – it doesn’t have to be placed by an external wall. 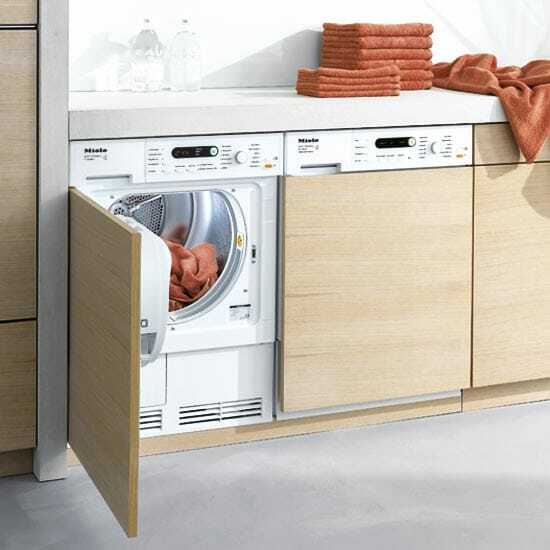 Vented tumble dryers draw and heat air from the room in which it’s located. The warm air is then blown around the drum as the clothes spin. The warm air passing through the clothes causes the moisture in the material to evaporate, and the air is then vented outside through the hose. This is why the water leaves the hose as steam and not liquid. Condenser tumble dryers work slightly differently. Instead of venting water by heating it, a condenser dryer works by condensing the warm air from the wet clothes into water. Once the air condenses into water, it is channelled into the reservoir. Why Buy a Vented Tumble Dryer? So if a condenser tumble dryer can be placed anywhere, and both types do the same thing, why buy a vented dryer? The key benefit to buying a vented tumble dryer is that they cost less than condenser dryers, and so the upfront costs are lower. The other advantage that vented tumble dryers hold over condenser dryers is that since they vent moisture straight outside, there is no water reservoir to empty. Why Buy a Condenser Tumble Dryer? As mentioned, one of the main benefits of buying a condenser tumble dryer is the fact you can place it anywhere in your home or garage, since they don’t require a hose to remove the moisture. This is hugely beneficial if you need a tumble dryer but have little choice in where you place the machine. For example, if you require a dryer but only have space in a room without windows, or you’re renting a home and don’t have permission to make a hole in an external wall, a condenser tumble dryer is the perfect option for you. Both vented tumble dryers and condenser dryers have improved in recent years in regards to energy efficiency, performance and the features offered. If your main priority is speed and you’re less concerned about energy efficiency a vented model is probably the best option for you, especially if you already have a hole in the outside wall from a previous dryer. If however you’re looking for a money saving option a condenser tumble dryer could be the better choice, heat pump models being the most efficient but bear in mind that they take longer to dry than normal condenser models as they dry at lower temperatures.